The appreciation of a piece of artwork is one that is very personal and temporal. At times one will linger to appreciate or re-examine a piece of work they have seen several times before, but this is a fleeting opportunity. Much of the art that we experience we may see only once in our lifetime as it is part of another museums (or individuals) collection and is either on loan to or part of traveling collection. Throughout the world this fascination with art has led many cities to invest heavily in the construction of new art museums to correspond to this newfound interest in art by the general public. These museums traditionally serve as reliquaries for art, they protect it, and provide a stable background from which to observe. However, many museums sterilize the experience of contemporary art through overt formality and inadaptability. The role of architecture in the presentation of art needs to be explored. The Traveling Pavilion seeks to break down the barriers between art, architecture and display by removing art from the hermetically sealed condition of the gallery and present it in a much freer and, potentially, more appropriate manner. By moving the art into a more public, less formal and temporal location artwork can be re-imagined by the viewer. This design exercise pursued a serial investigation of pavilions, while each pavilion was to be identical, the designs are distributed across the globe, engaging diverse climatic and cultural environments. These three (3) pavilions would travel throughout the world and were designed to be assembled, disassembled and re-assembled repeatedly. 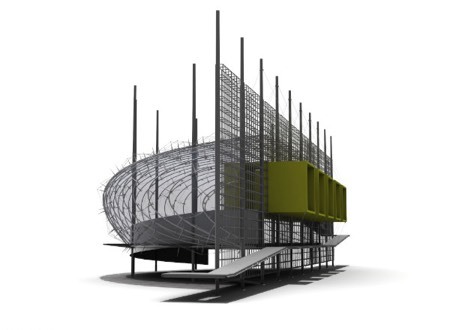 Focusing expressly on structural and assembly systems, through parametric design methods, this study critically explored not only the connection between art and architecture, but also examined the relationship between architecture and site, culture, and climate. As the pavilion must travel to locations throughout the world it must be capable of adapting to specific site conditions without a modification of the design or structural systems while still mediating the relationship between the architecture and the artwork. Parametrically controlled from the start, the pavilion is systematically malleable allowing for an in depth investigation of geometry, space, material and structure. These complex scripts enabled the students to explore both physical design and engineering simultaneously in an immaterial environment. The systems created by the students lengthened process of design as the systematic variability of the process was both based on ideas of the parts and of the whole.